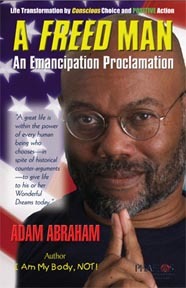 NOTE: This is essay #14 from my book, A Freed Man: An Emancipation Proclamation (ISBN 0-9700209-0-2 PHAELOS BOOKS $17.95). The subject of race is the ideological “black hole” of our times. So huge is the concept’s “gravitational pull” on our collective perception of reality, it seems to insatiably devour every thought that we throw at it without releasing any appreciable light in return. But while ideological black holes may be formless or even bottomless, I suspect that they are not infinite. Our race conundrum is a case in point. It is hard to engage in a conversation about race and not take a turn along its main street: racism. Racism is the unkind, unfair, immoral, and at times, evil behavior that one individual or group demonstrates toward another individual or group, based on race-defined factors. To further support their idiotic proclivities, these same people will often attempt to found their reason within some aspect of science, sociology, or religion. Racism is idiocy, pure and simple. It is idiocy because, rationalizations aside, the implicit foundation upon which racism is based—i.e., the existence of discrete and distinct “species” of human beings; some of whom are more or less “evolved” than others—is made of conceptual quicksand. Try as we might, no “race gene” has ever been found. You can bet if one had been isolated, it might be held as the “missing link” to the establishment of a true caste system in the western world. Racism is always negative in effect, though not always so in intent. It nonetheless affects both the “villain” and the “victim.” There are no winners in this game, which is where our problems tend to arise during dialogs on race. As a social dynamic, racism requires someone to play the respective roles in a sociological melodrama. As such, some people who are accused of being racists are not actually villains, and some who consider themselves victims of racism may not be, and need not be. Racism is not the problem in America today that it was fifty, twenty-five, or even ten years ago. It is therefore a “social toxin” of diminishing import in our lives. Erstwhile white supremacists are finding an equal likelihood of being openly and actively opposed by other whites, as by non-whites. At issue today are the many non-whites who still believe that racism is the main cause of their problems when in fact, they have many tools at their disposal to affect real personal and social change. Meaning no one any disrespect, the end of racism begins when we purge it from within ourselves. While racism itself is a terrible thing to experience, it is also terrible to be falsely accused of being racist, which happens with increasing frequency to innocent people. It is frustrating when an accuser passionately attempts to convince others of what is going on in your mind and heart, and more frustrating when others actually believe the accuser based on surface appearances. I speak not only for “whites” that may be accused of being racists by blacks, but also of other “blacks” that are assumed to automatically agree with the accuser en masse. Sometimes racism is the major cause of a particular example of social dysfunction. Oftentimes, it is not. When it is, it is incumbent upon the victim to learn to transcend the negative effects if he or she truly wishesto create positive personal and social ends. This is achieved more so by focusing one’s own thoughts and energies on positive goals than dwelling on someone else’s negative, and foundationless mindset, or calling more empowering attention to it. We create empowering attention when, identifying ourselves as victims, we shine light on something outside of ourselves and beyond our control as the cause of our particular malaise. Racism is one such object that is often given empowering attention. Racism is “empowered” when we create the impression that it is more powerful and persistent at holding us down than we are in lifting ourselves up; for example, without race-defined affirmative action programs. History provides many examples of people who significantly changed their lives in times of much greater racial stratification than today, without benefit of race-based preference systems. While many people do need to learn the mechanics of attitude, behavior, life, and history transformation, emancipation begins when they realize that their “race” does not constrain or limit them, but actually empowers. I refer to their membership in the human race. Distinctions beyond this one with respect to one’s true capbability or incapability, are, in fact, superfluous. The problem with racism is that its adherents practice discrimination, prejudice, and/or hatred on the basis of mythological factors rather than substantive facts. However, reversing the direction of the injustice does not break this behavioral circle, for it maintains the ideological foundation. Racism is racism irrespective of the direction in which it is focused. Hidden in the darkness of the black hole, behind the rhetoric, innuendo and animus, is a kind of thinking that is the real cause of the race conundrum. It is racialist thinking, which is more pervasive than racist thinking. Racialist thinking is the belief in various and distinct species of races. As a society, we are obsessed with race, and sometimes hopelessly racist in our ways. But much of this is because of racialist rather than racist thinking. Yet, even without racialist thinking—with one human community—we would be as diverse a group of beings as we are today. We would be as rich in positive possibility and historical value. However, we would have taken away one of the underpinnings of a form of social hierarchy. Racialist prejudices are not necessarily evil, nor based in hatred. We apply them not only to other groups, but also to ourselves as individuals. Racialist thinking requires, depends on, and does not question the efficacy of discrete groups of “races,” including “white,” “yellow,” “red,” “brown,” and “black.” If there really is no demonstrable “race” other than human, herein lies our problem. The terms that we use for the racial groups today are arbitrary and subject to change. Each human being possesses a single shading of skin: meaning his or her own. To believe in races is not necessarily racist, nor is it necessarily evil. But racist thinking stands on racialist beliefs: which have no real or meaningful basis beyond the context of sociology. Essentially, beliefs that this group can do that, and that that group can do this, form a collective perceptual context that influences what we choose to notice about those around us. And since that perception gets noticed more by collective agreement, the associated behaviors tend to get exercised more. Nature allows human beings of all shades, shapes, and sizes to procreate and create vehicles for new generations of earthly travelers. Over a long continuum of time, our bodies naturally (and divinely) adapt to environmental conditions. Within a single life continuum, our human Nature gives us the power and ability to affect changes in the style and quality of our earthly experience. This power and ability exists as “standard equipment” within all humans. It sometimes—okay, oftentimes—goes unused. Sometimes it is misused or abused. This is one link in the process of how innovations come into being. It is all a natural part of being human. The overview on human sentience opens the door to consideration of the current social state of affairs as it involves racialist thinking. It raises some natural questions as well. For example, are some racial groups more sentient than others? No. Sentience is a trait and quality that contributes to the definition of what is human. Another contributor is the design of the human body. I’m referring to the biomechanism itself, not its outer shading. It is unique in its ability to assist us in manifesting our highest dreams or worst nightmares. Another contributor is the fact that the product of human procreation is another sentient human being, capable of evolving and expressing his or her own unique worldview, which may be very different from that of one’s parents. Are some humans more conscious than others? The answer is an unequivocal yes. While consciousness is, in truth, immeasurable, it is by nature, unique to the holder. Consciousness is empowered and limited by the individual according to his or her desires, beliefs, attitude, dreams, hopes and fears. As such, variances in the quality and nature of an individual’s or group of individual’s experiences are natural. We get into trouble when we start believing that such variances are the result of our relative value or capability as human beings. It is more so a result of our relative motivation to change, complacency, willingness to settle or cope with the status quo, or the lack thereof. While we exist as biological life forms on earth, we are not animals in the sense of awareness and transformational capability. An animal’s consciousness and behavior is essentially “hard wired,” subject to change over generations, if at all, where a human being can affect dramatic changes within the course of a lifetime. Another question. Are variations in conscious awareness defined by “race?” I would say no, with a caveat. If a man or woman “defines” him or herself in a racialist way, then there will be an effect on their conscious awareness, and hence, there will be a variation according to the overall percentage of like-thinking people. It doesn’t matter whether people “like” what they are thinking in order to create a reality. It matters that they think what they think, and believe that what they are thinking, is supersedingly true. I’m sure that people who believe in Armageddon don’t “like” the idea, but certain beliefs—for example, in eternal “sin,” Judgment Day, a Savior, Heaven and Hell, or the need to “preserve the purity” of a “race”—continues to give life to the possibility. The superseding nature of these “truths” will vary from one person to the next. As such, so will their influence be on one’s day-to-day life experience. One of the most sorrowful truths of our time involves famine experienced in many parts of the world, especially in Africa. It is almost as automatic and cyclical as the monsoon season. I’m sure that these people don’t “like” their situation—hunger, disease, desolation and conflict. But their situation is more so the result of a massive behavioral rut than the result of their inherent inability to change. Are these people any less sentient than anyone else? No. Are they less conscious than those who have worked out their agricultural and distribution systems and decided to end generations of fighting and feuding? In practice, yes. Are they less capable of making a conscious change? No. Some have complained that “black” people hold a much smaller percentage of positions of power in the corporate world than “whites.” They cite every reason from racism to conspiracy, to racism. Racism in the form of slavery is clearly the progenitor of the disparity that exists today with regard to business ownership and control. However, today, racialist thinking continues to power that engine much more than racism does. Yet, racism often gets blamed when between people of different ethnic or social backgrounds get involved in a dispute. When we begin to realize that neither our skin color nor our social, ethnic, or genetic history defines our quality as human beings, or the potential that we can achieve in our own lifetime, an important milestone in sentience will have been met. Racist thinking presumes that because someone looks like we do, he or she will think like we do. It is also racist to think that because someone does not look like we do, he or she cannot or will not empathize with our situation, which can lead us to decide that we will not care about theirs. Racialist thinking—meaning a belief in an “us” compared to another group of “them”—is what allows racist thinking to exist. When we embrace our own humanity and appreciate the common thread of ability we share with every other human being, racist thinking begins to break down. Eventually, so will the race-patterned disparities. This will not be the end of disparities, for as long as there is free will; there will be variances in the quality of human experiences. But when we better understand and accept our oneness, as human beings, disparities that are presumed to be caused by one’s race-related capacity or incapacity, will disappear. Variances in such factors as income, wealth, and property will exist as long as humans exist because not everyone wants to be a millionaire. Indeed, if everyone were a millionaire, it would no longer be considered a meaningful achievement. A loaf of bread would likely cost $500 instead of $2. It will take time for people whose forebears have either historically, or habitually under achieved, to begin adopting new ways of believing, thinking, and then doing. But change does not begin without the conscious choice to embrace, rather than resist it, and the commitment to prepare one’s self for a successful journey, and the tenacity to see things through.